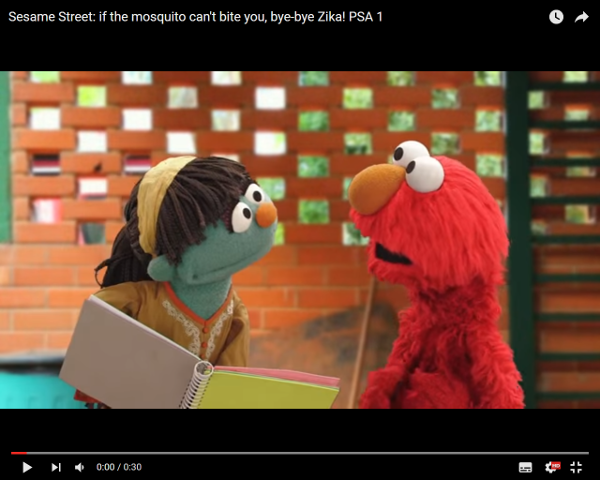 Sesame Street Muppets Elmo and Raya are taking on the Zika virus, helping to raise awareness and share critical information to reduce the spread of the mosquito-borne virus, now reported in 33 countries and territories of the Americas. The Muppet friends appear in two public service messages, sharing tips for avoiding mosquito bites with families in Latin America and the Caribbean as part of a joint effort with the Pan American Health Organization (PAHO), Regional Office for the Americas of the World Health Organization. Link to first PSA (English | Spanish). Link to second PSA (English).